Click here for £5.00 off voucher. For the first time ever, Nanshy, your favourite cruelty free make up brush brand will be exhibiting at the industry’s biggest and best event for 2015, the International Make-Up Artist Trade Show (IMATS) in London. 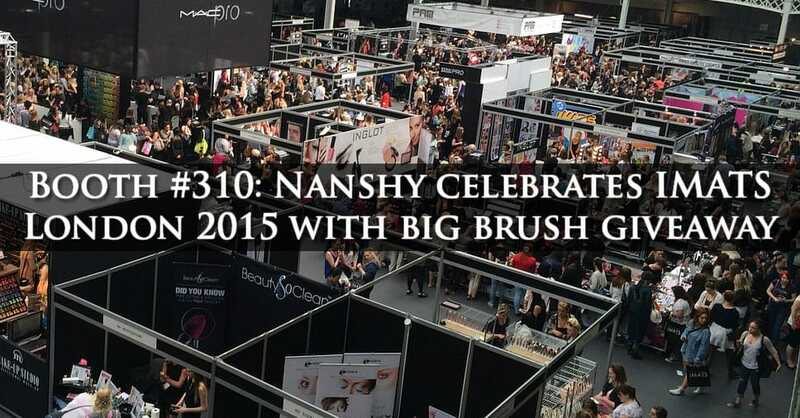 We’re super excited about being at the show this year, and are celebrating by giving you a chance to win a complete collection of superb Nanshy brushes to help you build your ultimate make up kit. If you haven’t been before, you should definitely make space on your calendar for the IMATS in London this year, as the speakers, exhibitors and workshops are looking better than ever before. For any fans of make-up, IMATS is most definitely the place to be. It’s the biggest gathering of make-up artists, suppliers, exhibitors and enthusiasts in the industry. It’s is a great chance to meet new friends, try new products, learn new skills and watch the experts at work. IMATS has been running since 2002, and gives make-up enthusiasts all the tools they need to advance their career as a make-up artist in fashion, TV, film and editorial. There are classes and workshops in a range of subjects, including red carpet glamour, body painting, prosthetics and horror make-up running all across the three days of the show, not to mention a list of hundreds of exhibitors showcasing products and giving demonstrations. High profile speakers and presenters, giving you their insight into the world of professional make-up. We’re very excited to see that Jan Sewell, BBC trainer and BAFTA award winning make-up and hair designer will be at the show. Her extensive list of credits for both film and TV include World War Z, X-Men: First Class and The Theory of Everything, and she’ll be sharing her tips on make-up, getting into the professional world and lots more from 14:00 – 15:00 on Saturday. Panel discussions and debates, of which we’re particularly looking forward to hearing from David White and Lizzie Yianni Georgiou about how they make the Guardians of the Galaxy look so amazing, which will be happening from 16:00 – 17:00 on Saturday. Don’t be shocked if you see a few aliens wandering around the show either, as the Guardians themselves will be visiting the event, showcasing their amazing costumes and make-up. Masterclasses from world class make-up artists. Get on the list as soon as you can if you’re interested in digital make-up design as award winning special effects make-up artist, Rod Maxwell, will be running a masterclass in using programmes like Photoshop, ZBrush and mocha Pro to create picture perfect special effects on Friday from 12:30 – 14:30. There are lots of other masterclasses on offer, from using prosthetics to contouring with colour, but numbers are limited so get your name down quick! Amazing competitions, like the Battle of the Brushes, where recent graduates compete to produce the best make-up effects in a time limited competition. This year the competitions are the Age Make-up Challenge using prosthetics, and Historical Beauty Trends. Competitors have three hours to create their look, which will be seen by industry pros and social media users following the show, as well as featured in show graphics for IMATS. Go and cheer your favourite along as they race to win the cash prize and the chance to boost their professional career! Thousands of exhibitors, from big names like Bobbi Brown and MAC Cosmetics to niche and new brands like Nanshy and Eldora Eyelashes, many of whom will be running fun competitions and giveaways from their stands. Lots of exhibitors, including Nanshy, offer exclusive discounts on products for the show, and many brands launch never before seen products at IMATS, available to buy for the first time from their stands. Extra for 2015 is the make-up museum, where you can see the history of make-up all in one place. IMATS really does offer absolutely everything for the make-up enthusiast, all under one roof. If you want a first-hand account of why IMATS is the ideal event to attend, check out what Lily Melrose, one of our favourite bloggers, got up to at the show last year right here. For the professional’s viewpoint, DorotaMUA wrote a fabulous post about her experience at the 2014 IMATS show here, including breath-taking images of exhibitors, demonstrations and more. There are more lovely photos of last year’s show at Sprinkling of Dust, Zoe London and Beauty Look by Marta. Education, motivation, enlightenment… whatever you’re looking for this year, you’ll find it at the IMATS in London. Of course we couldn’t go all the way to IMATS and just try to sell brushes. This event is something special, so we wanted to do something really special too. For our wonderful customers who come to see us at the show, we’ll be offering some exclusive discounts on our popular brushes, storage solutions and sponges, to help you complete your Nanshy collection for less. As well as our generous special offers, you’ll have the opportunity to meet our celebrity make-up artist and Nanshy ambassador, Barrie Griffith in person. Him along with beauty expert Nikki Taylor will be on the stand giving presentations about all the latest make-up trends and fashions, as well as to answer any of your questions about make-up, the Nanshy range or becoming a professional make-up artist. If you haven’t met Barrie G before, you’ve probably already heard his name. He’s a London based celebrity make-up artist and ex professional dancer who has worked with the likes of Vivienne Westwood, Kate Moss, Tim Burton, Bianca Jagger and Helena Bonham-Carter. You can find out more about Barrie G at his website. Three lucky Nanshy fans will be drawn at random before the show starts, and we’ll announce the names via our social media feeds in plenty of time for the show. Winners can come and see us at IMATS 2015 to collect their prize and to chat to Barrie Griffith about how they can use their new Nanshy kit for make-up perfection! 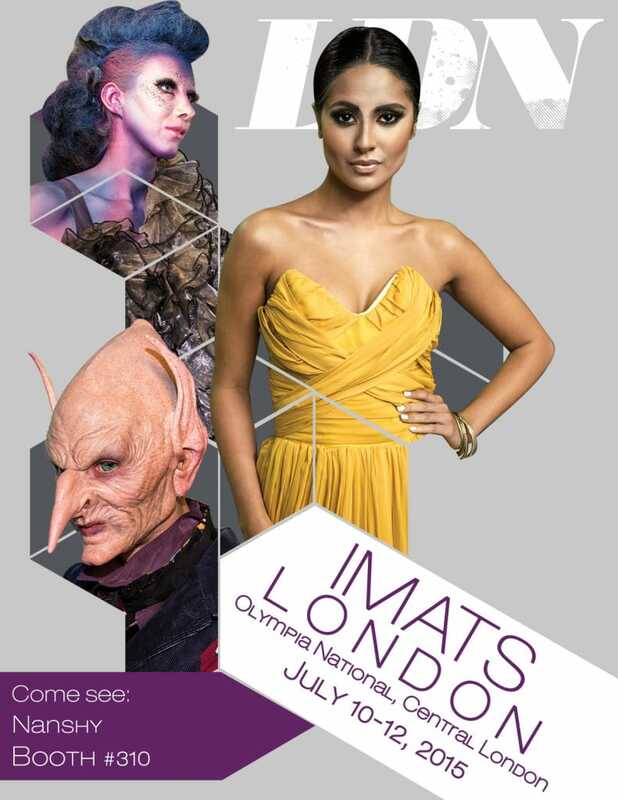 The IMATS London 2015 will be on July 10th – 12th at the Olympia National Exhibition Centre in Central London. Tickets can be bought from the IMATS website and you’ll find Nanshy hanging out at trade stand number 310. See you at the show! Excellent! Looking forward to the show! wonderful! I haven’t ever been here! I’ve never been to an IMATS. But this giveaway is awesome! No, Ive never been to IMATS. Never been to IMATS but itve heard its great and would love to go! I have never been but think i will be going in the future! Ohh! Thank you Nanshy for this giveway! See you at IMATS! Never been to IMATS but it always looks amazing!! I’d absolutely love to have the chance to go to the imats! See you there, I’m attending on the saturday! I wish I could go to imats, but I unfortunately can’t make it, although I’m starting a makeup course this year and these brushes would be perfect for my kit. I’ve never been to IMATS before. My bestie & I were talking about going to the one in NYC back in April but bc of my crazy work schedule we didn’t even bother trying to get tickets. I’m disappointed but hopefully I’ll get to go next year. Never been to IMATS! Dream to! This is my 3rd IMATS! Can’t wait!! Ahh it looks like so much fun. Wish I could go! Probably for the best as I would probably end up spending way too much money. Never been but would love to someday! Unfortunaely I have never been lucky enough to attend IMATS but I am hoping to in the future! Cant wait to see you at IMATS, This will be my third year! First year at imats i am so excited! ! I havent been to the show or used your products yet. went to imats last year and it was absolutly amazing will be going this friday and am vey excited to network and meet specifically with brands. No I’ve never been would love to go.